I took this photo last year, at one of the villages of Kars, an eastern city of Turkey. 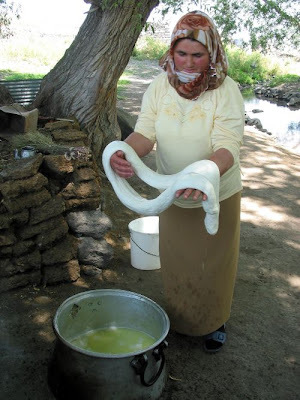 This woman and other women in her family (an in the village) make this string cheese, called 'çeçil'. They are the ones who makes the cheese but men take them to sell. 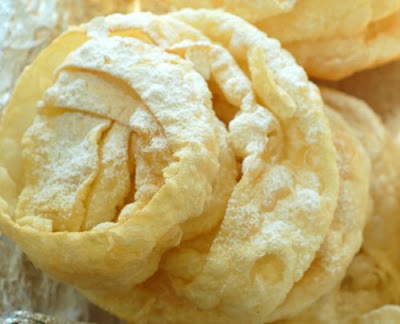 This is a fried bread (kind of a phyllo dough) I tasted at a small bakery called Tandoory Bread at Borough Park, New York. It was owned by Bukharan Jews. The bread (sprinkled with powdered sugar) was very interesting. I tried to get information on it but couldn't get much. She said it's made in Uzbekhistan all the time, daily and on holidays such as Navruz. I wonder if this bread is made in other countries as well or not and I'd love to know a little more about it. 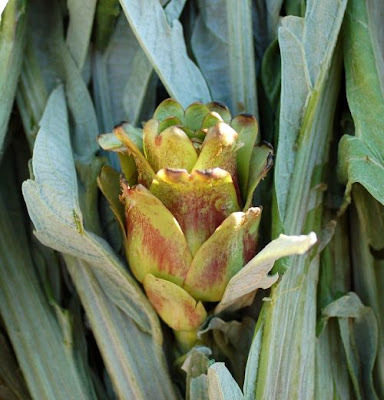 Yes, the first artichokes of the year. This is the best part of travelling. You see so much. You try so many new things, cheeses, snacks, wild greens... This photo is taken at the Selcuk Market, on the 19th of January. Most of you would know Selçuk because of Ephesus. Selçuk is where you go to visit Ephesus. So I'm at the market. It's a sunny day. So warm, so colorful. You start walking and you see these artichokes. If I'd say this is kind of an exotic flower, many people would believe in me. But it's a vegetable at the same time and I made a wonderful cold dish with them. (I got three artichokes for 3.75 new Turkish lira, which is a little less than 3.5 dollars) I cut the outer leaves and cut the top of them, 1-2 cm each. I cut them in four pieces and cleaned the hairy part. I then kept them in lemon water so they stayed white. I sauteed an onion, added the artichokes and the juice of half a lemon and added two potatoes, cut in small chunks. And of course, virgin olive oil and salt and pepper. That's it. Then we ate it warm (although I say it's a cold dish). It was heavenly. I have colorful memories from the Bodrum Farmers' Market. I lived in Bodrum (a coastal town on the Aegean region of Turkey) for about two years and visiting the weekly market (was on friday) was one of the most thrilling things to do. I always love the variety of the goods and the amazing people (mostly women) who bring them to the market. Usually it is something from the garden or something they made just that morning, or a day earlier. These figs are among the many things I used to buy from the market. From Elif Ana, an elderly woman, very funny, very chatty, who was one of the most successful sellers in the marketplace. I could never forget the flat breads she used to bake. Bread with olives and nettle! So tasty! 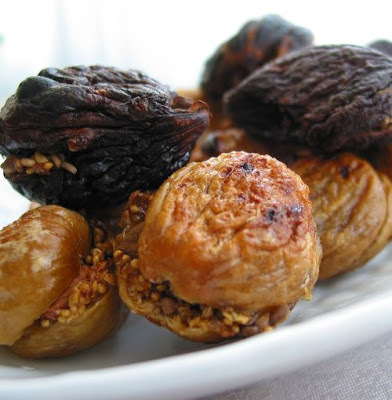 Each week, she would beg me to buy figs as well, baked with sesame seeds and almonds. She was so smart to offer one to taste, she knew I would not resist after that tasting that sweetness.